In the morning we went on a panga ride (also known as a dinghy!) 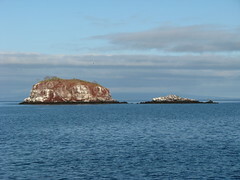 around the Marielas Islands, three small islets in Elizabeth Bay. On the islands and surrounding the islands, we saw penguins, Nazca boobies, blue-footed boobies, flightless cormorants, and red sunstars. From there we headed over to the shore of Isla Isabela and were taken into some mangroves and a small bay. The mangroves there were both red and black. 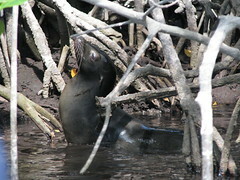 There were tonnes of sea turtles swimming in the bay and a sea lion sleeping up in the mangrove roots. The locals call these sea lions monkey sea lions because they have adapted to climbing up and resting on the roots of the trees instead of climbing onto a beach or rocks as most would. 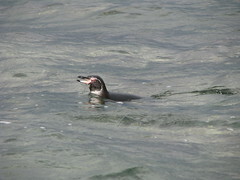 On the way out of the bay we saw a penguin swimming and a lava heron on the shore. In the morning we went for a walk on Punta Espinosa, on Isla Fernandina. From the dinghy along the shore we saw flightless cormorants, penguins, pelicans, sea lions and some sea turtles swimming in the water. Once on land, the first thing we saw was a nesting ground for marine iguanas. And thousands of iguanas! The iguanas were sunning themselves on the rocks, piled on top of each other. It was incredible. We would see one huge group, walk on a few more meters and see another huge group. 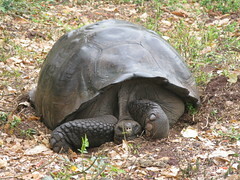 We passed various types of mangroves, a Galapagos hawk and oyster catchers. We passed by a small bay, where there were hundreds of fish jumping now and then out of the water, as well as two sea turtles mating (apparently the whole process can take hours!). There was also a whale skeleton set out on the rocks at one point. Apparently it had been carried there and re-assembled at some point, but had been there so long it was bleached pure white. 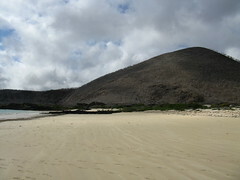 This island was again one very recently formed by volcanic activity, in fact, Fernandina is the youngest of the islands. 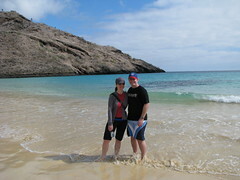 In the morning we went for a walk on North Seymour Island. We had to make a very early start to the day, because today we were dropping about half the passengers off at the airport and picking up a bunch more. 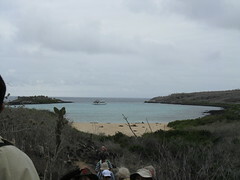 The main animal life on this island consisted of birds. There were a lot of nesting grounds, where small babies and immature birds were growing up. 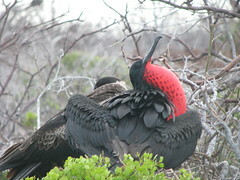 We saw blue footed boobies, frigate birds with their red throats inflated (the males do this to attract a mate) and lava gulls. 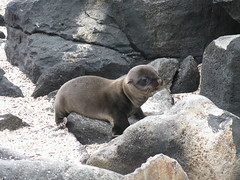 We also saw some crabs and sea lions with very small babies (probably almost newborn) trying to feed from their mothers.